A similar scene with Cal Fire and Sheriff’s rescue helicopters. Photo via San Diego County Sheriff’s Department. 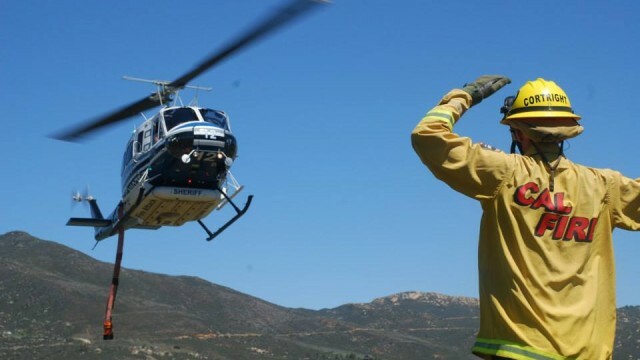 A San Diego County sheriff‘s Search and Rescue team rescued three hikers who were stuck on a rock on the side of a mountain at Sloane Canyon, near a waterfall in Jamul, a sheriff’s sergeant said Sunday. The last hiker was brought to safety at 1:30 a.m. All three hikers refused medical treatment, according to Sgt. Matt Mays of the San Diego County Sheriff’s Department (SDSO). All three were rescued near 3856 Sloane Canyon Road. It was not immediately known what time the hikers, males between the ages of 19 and 22, were reported missing. One suffered from a lacerated hand and head injury from falling several feet onto his head, Mays said. “The three males go to this area often without issue, but Sunday became stuck on a rock on the side of a mountain due to the rain,” he said.